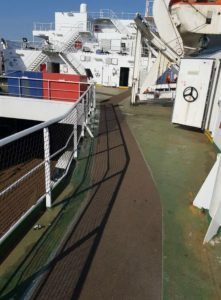 P & O Ferries got in touch with Thortech Bridges & Marine with a requirement for 370m2 of anti-skid surfacing to be installed to ramps on the vessel. 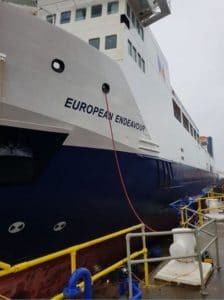 The European Endeavour is a roll-on/roll-off passenger ferry which is operated by P&O Ferries having taken ownership of the vessel in October 2007. P & O sent a request to Thortech to quote for anti-skid surfacing to be completed whilst the vessel was in Dry Dock. After being awarded the contract for 200m2 on the project, the client got in touch with Thortech Bridges & Marine with a request to remove the existing anti-skid system whilst the vessel was in transit en route to Dry Dock, this being the passage from Birkenhead down to Falmouth. We then had to get plans in motion ensuring our removal and blasting team arrived at Birkenhead ready for the works to be carried out. 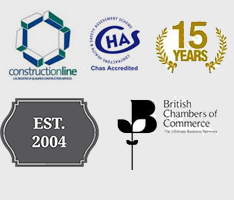 Whilst this work was ongoing we had an additional request for 170m2 of walkways to be carried out on the upper deck. When the vessel arrived at Falmouth, our application team travelled south to Falmouth. As the vessel was now in Dry Dock, we had to get all the materials, tools and machinery lifted onto the vessel. Emery Bauxite aggregate and left to fully cure, the next day we swept off the excess aggregate ready to be re-used on the next area. 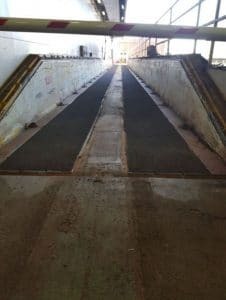 We then completed the same process for the Tilt Ramps.